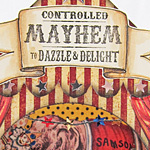 Shown as part of a Circus Book Giveaway. 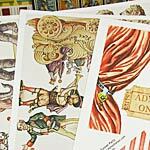 Adorable set of "parts" (including curtains, banners and a circus tent top) to make your own version of Kristin's Circus Tunnel Book shown below! Note: sized for 4" x 4" projects. 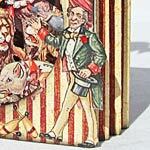 Big Top Tunnel Book by Kristin Batsel; other components in Kristin's artwork. Click here to see more photos in the Gallery, or learn more about Kristin's project in the blog.